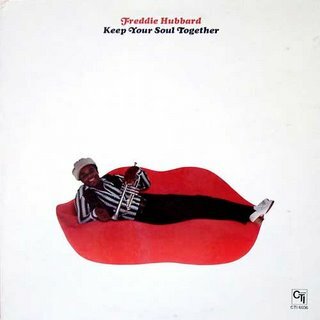 A fine and funky bit of soul jazz from trumpeter Freddie Hubbard in 1973. Ron Carter provides a very funky cycling bass line which ably anchors the song, along with the support of both drums and percussion. Over this both Hubbard and Junior Cook on tenor sax solo take extended periods. Of the two, Hubbard gets the bigger space, demonstrating what he'd learned through his years: staying mostly blue and groovy, he does manage at times to throw in shades of Miles' bop playing. A light sprinkling of electric piano runs along behind this, somewhere between the rhythm and the solos. There is not a lot of trumpeters in soul jazz, which mostly featured some combination of sax, guitar and organ. So it is a treat to hear this track, especially as it is one of the funkiest examples of the genre.